This sticker indicates that the building houses an automated external defibrillator unit, which can be used in the event of a cardiac arrest to help restart an individual's heart. 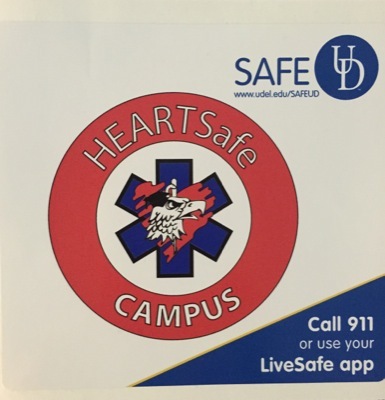 The Virden Center on the Hugh R.Sharp Campus in Lewes now has a "HEARTSafe Campus" sticker. 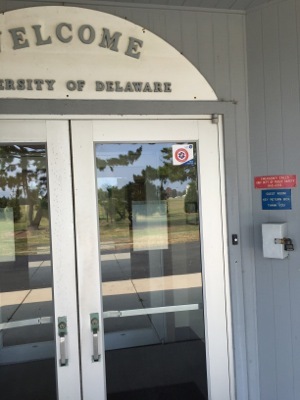 4:10 p.m., Sept. 4, 2015--New red, white and blue stickers with the words "HEARTSafe Campus" now grace the entrances to 35 buildings on the University of Delaware's Newark campus, two buildings on the University's Hugh R. Sharp Campus in Lewes, three buildings in Georgetown, and two in Wilmington. The presence of the sticker indicates that the building houses an automated external defibrillator (AED) unit, which can be used in the event of a cardiac arrest to help restart an individual's heart. In addition to the buildings, all UD Police cars and the University ambulance are also equipped with the devices. UD was awarded the HEARTSafe Campus designation earlier this year by the National Collegiate Emergency Medical Services Foundation (NCEMSF). The recognition program was developed to focus on public CPR training and rapid access to AEDs at academic institutions, and only 14 institutions across the nation hold this designation. According to NCEMSF, the cornerstone of any HEARTSafe Campus is a vibrant campus-based emergency medical response organization. To qualify for the award, UD completed and submitted a rigorous self-assessment and verification packet and fulfilled all required criteria to improve the chances that anyone suffering a sudden cardiac arrest will have the best possible chance for survival. For more information on CPR classes or the AED program, visit UD's Environmental Health and Safety website.